The New Moon (and solar eclipse) occurred early this past Tuesday morning (2:14 am), April 29 on the east coast. The sun was well below the horizon here so no great visual effects, only vibrational! This New Moon was the bookend to the Cardinal Grand Cross that peaked a few days earlier. We began the month of celestial activities with the Full Moon/Lunar eclipse on April 15th. It was quite a month! Have you felt the effects of the transformational energy? 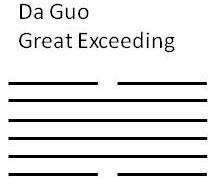 It was with a certain level of excitement during this time that I cast the Gua (I Ching hexagram) to determine the energies we are heading into for May. If you follow my blog you know that I use yarrow stalks and manipulate them in traditional fashion to determine the six lines (either open/yin or solid/yang) that compose the Gua. The hexagram consists of two trigrams; the lower is Xun or Wood and the upper is Dui or Lake. So Great Exceeding is like a lake over a tree. Isn’t it interesting that there has been a tremendous amount of rain here in Maryland with significant flooding just after this New Moon! During this time of “Great Exceeding” there is a need for “extraordinary action.” The action required is to balance, or adjust for that which is exceeding limits. The image offered by Master Huang and King Wen’s Decision is that of a roof beam with weak end supports (the strong yang lines bounded by the two weak yin lines). The roof sags under weight. Extraordinary action is required to straighten the roof and balance the load. Smooth and joyous in action. Truly great is the time of Great Exceeding! Watch for imbalances in your life, correct them promptly and decisively and have a great month!